(Nanowerk Spotlight) Storing the fuel that is needed to run a hydrogen car in a compact and affordable way is still a major challenge. You would need about 5 kg of hydrogen to have the same average driving range as today's cars. Since hydrogen's density is only 1/10th of a gram per liter at room temperature, that means you somehow need to pack 50,000 liters of hydrogen into your tank. There are three ways of doing this: as a high-pressure compressed gas; a cryogenic liquid; or as a solid. 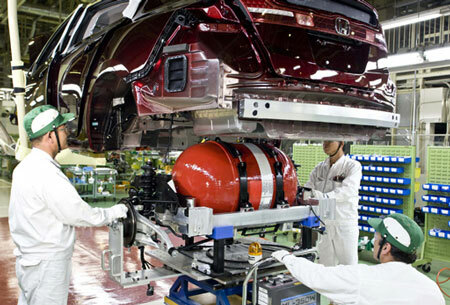 Compressed hydrogen gas tanks are used in early hydrogen-powered vehicles. Honda, which just two days ago announced that it began production for its FCX fuel cell vehicle, uses two 350-atmosphere high-pressure hydrogen tanks that give the car a 430 km driving range. Rather than using hundreds of atmospheres to compress hydrogen into a tank, or cooling it down to minus 252 °C to liquefy it, hydrogen storage in solid form offers the safest alternative for transportation and storage of hydrogen. Research in this area has led to metal hydrides, chemical hydrides, and physisorption-based storage, where hydrogen is adsorbed onto the interior surfaces of a porous material. The stored hydrogen can then be released by heat, electricity, or chemical reaction. Many metals are capable of absorbing hydrogen as well. The storage of gas in solids is not only an intriguing alternative for hydrogen storage but other types of gases, such as carbon dioxide and other environmentally important gases as well. Gas storage in solids is quickly becoming an important technology, with applications ranging from energy and the environment to biology and medicine. A new review article in Angewandte Chemie describes the types of material that make good porous gas storage materials, why different porous solids are good for the storage of different gases, and what criteria need to be met to make a useable gas storage material ("Gas Storage in Nanoporous Materials"). Written by Dr. Russell E. Morris and Dr. Paul Wheatley, a researcher in Morris' group at the University of St. Andrews in the UK, the paper discusses the use of nanoporous materials for gas storage in three areas: energy, medical, and environmental applications. The two write that for most of these applications, but particularly hydrogen storage, we are still in the materials discovery phase of research. "Once materials with suitable properties have been made and characterized the research focus will change more towards making the applications work, bringing in engineering. This is already happening to some degree in certain areas but will undoubtedly increase in the others also. There are also some interesting gases (e.g. ozone) that have not yet been studied in this context, and there are opportunities for the innovative chemist here also." Safe, efficient and compact hydrogen storage is a major challenge in order to realize hydrogen powered transport. According to the U.S. Department of Energy Freedom CAR program roadmap the on-board hydrogen storage system should provide 6 weight % (wt%) of hydrogen capacity to be considered for the technological implementation. Several porous materials and strategies for enhancing hydrogen uptake are reviewed in the article. Given the current state of the research, the authors conclude that meeting the goals set by the Department of Energy, while theoretically possible, is a great challenge and it will take an exceptional Material to be successful. Morris and Wheatley write that, while energy applications of gas storage materials have recently taken the spotlight in this area, gas storage materials for medical applications are arguably much closer to commercialization. "The field is dominated by the potential applications of nitric oxide, but there is scope for the development of other gases also. Prime amongst these is probably carbon monoxide as our understanding of the important biological relevance of this molecule is developing very quickly. "Unlike energy applications there is much less emphasis on gas storage capacity when designing materials for medical applications. Often much more important is matching the release of a gas to that required biologically. This control over release kinetics is vital as the gases of interest are often toxic in large amounts (e.g. nitric oxide and carbon monoxide), while they may be ineffective if delivered in too small amounts." The capture and storage of greenhouse gases could play a significant role in reducing the release of greenhouse gases into the atmosphere and nanotechnology materials such as carbon nanotubes and nanoporous metals will play an important role in developing suitable storage applications (see "A role for nanotechnology in capturing and storing greenhouse gases"). For environmental gas storage the focus tends to be on high adsorption capacity materials. "The challenge here is to synthesize solids with large numbers of high energy interaction sites" the authors write. "The nature of carbon dioxide in particular means that there has already been demonstration of some interesting adsorption effects, particularly associated with the flexibility of the adsorbent materials, and we expect that as we understand these effects further we will be able to produce better materials." Overall, the authors conclude that gas storage in porous materials is an area of great excitement and potential importance in all the areas covered in their review. They caution that the challenges associated with designing materials to have sufficient adsorption capacity, controllable delivery rates, suitable lifetimes, and recharging characteristics are not trivial in many instances. Furthermore, the different chemistry associated with the various gases of interest makes it necessary to carefully match the properties of the porous material to the required application.